​With over 2 million Airbnb listings, how do you make yours stand out? In our previous article, we talked about how to increase your Toronto Airbnb bookings with better pictures, descriptions and improving your Airbnb SEO. But without great reviews, your efforts spent on enhancing your property’s photographs and literature might go to waste. Potential guests rely on reviews from your past guests to provide an unbiased report on their whole Airbnb experience, which encompasses their interaction with you and how your property lived up to their expectation. Click here to read more. ​Ever heard the saying ‘don’t judge a book by its cover’? Well, potential guests who surf the Airbnb site in hopes to find “the” perfect accommodation will be judging each listing by how it is presented and the star rating is has. A sloppy listing with minimal stars conveys to the reviewer the host is not serious and most likely the property will not meet their expectations. Click here to read more. Survey after survey within the hotel and hospitality industry shows that cleanliness is one of the most important factor when selecting a hotel for travellers. This naturally applies to Airbnb homes. 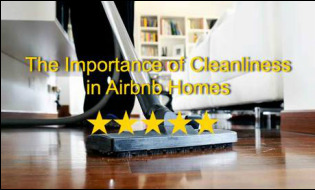 As an Airbnb host in Toronto, having a clean home goes a long way towards getting that 5-star review from your guest, which in turn helps you bring more guests to your home. Click here to read more. As the popularity of Airbnb accommodations in Toronto continues to rise, Airbnb hosts have to continually provide exceptional standard services as well as user experience, ranging from essential services to added values. Here are some productivity hacks that will help both seasoned or amateur Airbnb hosts in Toronto to run their rental properties like a pro. Click here to read more. You need a reliable and affordable cleaning service to prepare your home and create a welcoming experience for your guests. You want a cleaning service that is available on-demand; one that knows what guests appreciate. Dhyana Cleaning is the company you’ve been searching for. Click here to read more. As an Airbnb host in Toronto, there are plenty of events year round to keep your property occupied. By being on top of the calendar of events and utilizing the new dynamic pricing tips known as "smart pricing" - which was rolled out in early May '16 - your revenue may increase by 13 percent on average. Click here to read more.